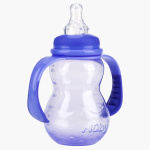 Nuby Feeding Bottle with Handle - 210 ml | Blue | Anti-colic bottles to prevent baby from gas and colic. Give more independence and fewer spills for your little ones, with this attractive feeding bottle. It has handles and is designed in such a way that it allows you to serve a variety of soups, juices and other essential liquid foods without any worry.